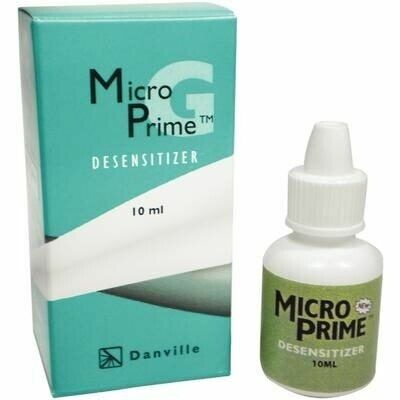 MicroPrime desensitizer eliminates post-op sensitivity and discomfort from cervical erosions. Proven HEMA formulation reliably plugs tubules. Compatible with all total-etch bonding systems, cements and amalgam. MicroPrime is now available in two formulations: original MicroPrime B, proven effective for nearly 10 years and new MicroPrime G, which is an equivalent formula to Gluma* - at a far lower price. MicroPrime G also serves as an ideal antimicrobial when used with self-etch adhesives. Acid etch, wash & dry. Apply MicroPrime & let sit in 10-20 sec. Air dry and apply adhesive. Apply MicroPrime to cut or cleaned dentin and let sit in 10-20 sec. Air dry, apply composite or amalgam. With exposed root surfaces, results will be temporary.